Submit full payment before course deadlines. Complete online application and all required forms within your application. This includes: Ethical Guidelines form, Teacher Certification Agreement and a Medical Information Form. Memorize the Jivamukti Balancing Class (volume 6) and the Jivamukti Back Bending class (volume 7), found in the Jivamukti CD/DVD Portable collection. You are advised to transcribe these classes and bring your typed/written transcriptions with you to the course. Practice the Chakra Balancing Yoga DVD by Sharon Gannon. Practice the Jivamukti Beginner Vinyasa class (volume 2) and the Jivamukti Class for Busy People (volume 5). Read Yoga Assists by Sharon Gannon and David Life. Also, bring this book with you to the training. 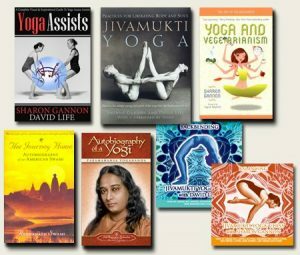 Bring Jivamukti Yoga and Yoga Assists with you to the course; (available in ebook and on Kindle) you do not need to bring the other books. If English is not your native language, you may want to consider buying and bringing/downloading a basic anatomy text in your native language. Read the whole book (either one) and write one paragraph describing something you learned from the book. Write your commentary as if it were to be given as a spiritual teaching in a yoga class you would teach. The purpose of the exercise is to see that you have read the book and reflected on it. Do not use direct quotations from the book or from any other source, except at most a very brief phrase if absolutely necessary to make your point. Read The Magic Ten and Beyond by Sharon Gannon. Available June 19th. Choose one focus of the month essay posted on https://jivamuktiyoga.com/teachings/focus-of-the-month from the current calendar year or the immediately preceding calendar year (so for a teacher training course in 2017, choose one essay from either 2016 or 2017). Read the essay carefully and write a one paragraph commentary on it. Write your commentary as if it were to be given as a spiritual teaching in a yoga class you would teach. The purpose of the exercise is to see that you have read the essay and reflected on it. Do not use direct quotations from the essay or any other source, except at most a very brief phrase if absolutely necessary to make your point. Print the title of the book immediately above your paragraph commentary for that book. Print ALL commentaries one after the other on one single sheet of plain 8.5 x 11 paper (or closest standard size for international students), double-sided. If you cannot print double-sided, then print all commentaries on no more than two sheets of paper, stapled together. Include your name on the top of the page, or if using two pages then on the top of each page. DO NOT include plastic folders, fancy clips or anything like that with your commentaries; they should be submitted as one single sheet of paper (or at most two if you cannot print double-sided). Spiritual Commentaries need to be submitted in person on the first day of training to the Production Coordinator. Please do not mail your Commentaries to Jivamukti Yoga School. All the above listed BOOKS required for the course and spiritual commentary.